During my summer internships at General Foods, I worked with many industrial processing techniques and chemicals that I later dismissed as having no practical value for a home cook working on a much smaller scale. 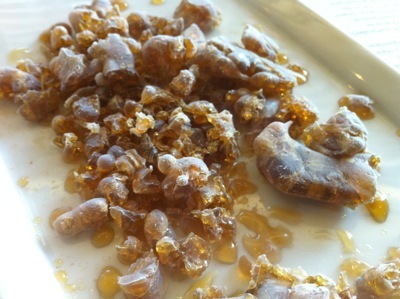 I was proven wrong years later when the collection of techniques lumped together under the name “molecular gastronomy” became standard tools in modern cooks’ kitchens. I have been experimenting with transglutaminase and maltodextrin as recipes have required, but was in need of some re-education. book to be published this fall. Although I knew quite a bit about working with gels from my GF days, I didn’t appreciate how many uses different uses hydrocolloids (substances that form gels in the presence of water) could have in my kitchen. And, as has been made clear to me previously, it’s all about the ratios. A simple vinaigrette with a 3:1 oil-to-water ratio is constructed to dilute the vinegar’s acidity and provide a specific mouthfeel, but it’s a waste of good oil. Alex demonstrated an alternative by making a vinaigrette with coffee, wine vinegar, agave nectar, salt (always in the 0.5% to 0.75% ratio in food), and 0.2% xanthan gum. After a quick spin in the blender, he had a dressing that didn’t separate, was perfectly balanced, and had the same mouthfeel from the xanthan as you wold expect from oil. 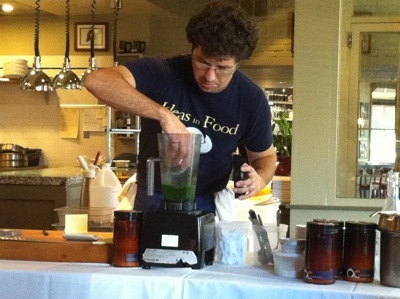 Similarly, he made a oil-free parsley puree with xantan that was bright and fresh, not dulled by added oil. The last section discussed the utility of various carrageenans, demonstrated by making a corn “cheesecake” from corn puree, ricotta cheese, and a combination of iota and kappa carrageenan. The class handout hinted at a “sliceable eggnogg” but didn’t provide a recipe, something else for me to investigate. I was on much more familiar ground in this class, since I had worked extensively with liquid nitrogen in the lab. I knew all about the safety and handling, and the basic deep-freezing effects the liquid had on food. What I was unprepared for was what could be done with a few basic techniques. Trim and peel whole beets, drop them in LN2, let them shatter along internal fracture lines, and then let them come up to room temperature. 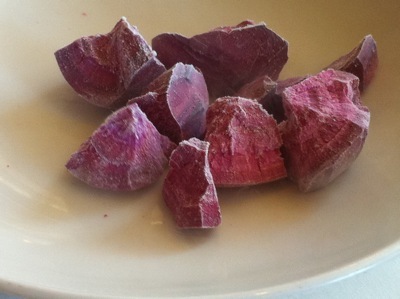 The end product, “broken beets,” are fresh tasting with a firm texture, just as if they had been blanched and shocked in water. Similarly, you can drop whole raspberries in LN2 and shatter then into individual druplets. 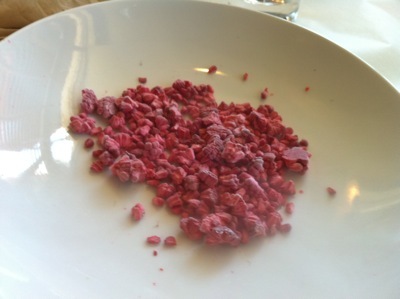 But the real ideas come when you realize you can grind flash-frozen foods into powders, which can be treated as either unique preparations or ingredients. For example, you could add frozen powdered aromatics to a bread dough recipe to ensure even dispersal of the flavors without ending up with little chunks in the finished loaf. The lecture veered dangerously close to a Will It Blend? 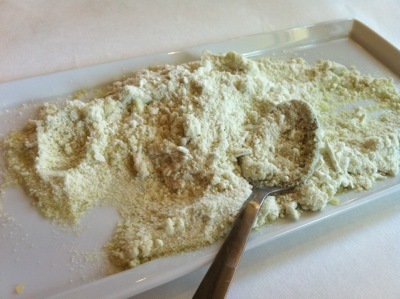 video as other ingredients — brie, brioche, lemongrass — were frozen and then pulverized into powders. The powdered lemongrass suggested any possibilities, the least of which is being able to add it directly to a dish without having to worry about fibrous residue. Some of the powder was steeped in hot water, producing a very aromatic lemongrass infusion which could be added to broths or used in a cocktail. The second was a play on a traditional cheese plate: powdered brie, brioche, and raspberries, seen at the top of this post. The lecture ended with a classic LN2 application: making ice cream. Not just any ice cream, mind you, but coconut-yuzu ice cream that was served with the remaining shattered raspberries. I wond up filling two notebook pages with liquid nitrogen-facilitated ideas, but realized that they would be harder to realize than the previous gel-based concepts. Although She Who Must Be Obeyed assures me she has ready access to LN2, it’s difficult to transport and store, and evaporates quickly. I suspect I’ll be bringing my ingredents and blender to her lab and returning to the Belm Utility Research Kitchen with containers of frozen powders. The commercially available versions of transglutaminase are all manufactured by Ajinomoto, the Japanese food conglomerate behind the current “umami” craze. They market it under the trade name Activa, which is what I bought when I made pork sirloin roulades. What I learned in the class was that Activa is available in four preparations, and what I used, Activa RM, can be sprinkled directly onto proteins. There are three other preparations: Activa Y-G, Activa TI, and Activa GS, each with specific formulations and applications. Activa GS is used in liquid form and can be brushed like glue on the surfaces you want to bond. Slice a skirt steak in half, brush each surface with liquid GS, lay one half on top of the other, then wrap the whole thing in GS-coated thin-sliced bacon. Wrap in plastic and place under vacuum to tighten, cook sous vide for an hour, and then drop the cooked steak in a deep fryer to crisp the bacon. What you wind up with is bacon-wrapped steak that doesn’t need to be tied to hold everything together. I plan on making this dish very soon. We glossed over Activa TI, which can be used in vegetarian and emulsified food applications, and moved directly to Activa YG, which was designed specifically for dairy applications. We tasted a preparation of ricotta gnocchi that contained nothing but the cheese, some egg yolks, parmesan, spices, and YG – no flour was added to bind the ingredients. The mixture was piped out in tubes onto sheet trays and refrigerated. When chilled, the tubes were cut into dumplings and simply sauteed in butter. I regret every time I’ve used the phrase “melt in your mouth” to describe light gnocchi, from now on that term is reserved for this recipe. The final demonstrations were making mozzarella “noodles” by spreading a mozzarella/ricotta/YG mixture over acetate sheets, chilling, and cutting the sheets into strips. They could be cooked exactly like pasta, tasted like fresh mozzarella, and maintained their integrity after cooking. Lastly we tried a bread pudding in which the soaked bread was bound together with Activa, compressed, chilled, and then sliced for frying just like french toast. 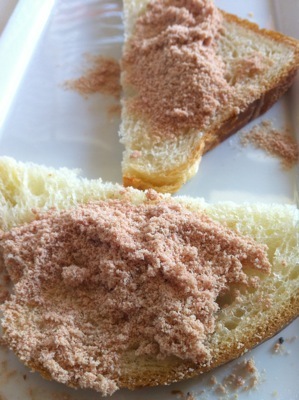 In fact, you could dip the pudding slices in french toast batter, dredge with frozen brioche crumbs, fry in butter, and then garnish with frozen maple syrup drops: molecular brunch! I’ve gone on here longer than I planned, but my inner biochemistry geek must occasionally be satisfied. I learned a lot. A lot. So much that I’m still processing my notes two days later and discovering more ideas. With any luck I’ll report on some of my experiments here. In the meantime I’ve added Ideas in Food to my must read food blog list. I suggest you do the same.